I have gathered a collection of equipment over the last few years that does not quite fit together. The task at hand is to work out the upgrade process to my setup to get the best of both home theatre and stereo music. A challenge that unfortunately, from reading a lot of material, looks like it will cost me a tidy sum. This page is intended to provide a history of my purchases with an overview of my equipment and how I plan to upgrade it over the next while. My first foray into hi-fi was when I was living in Australia. I lived in Brisbane at the time and was keen on getting a small system for my room. If I remember correctly I was thinking of some nice bookshelf speakers an amp and a CD player to put in my bedroom. I ended up talking to a friend of mine from my high school days, Viktor Major. He lives in Sydney and is interested in hi-fi too, albeit further progressed than I am! I was going on a business trip to Sydney so I stayed the weekend and we went shopping. I ended up choosing a TEAC Reference 500 system with the TEAC A-H500 integrated stereo amplifier and the TEAC PD-H500 CD player. I auditioned some bookshelf speakers, but cannot remember the name now. They were about AUD$1,200 for the pair. Then my friend Viktor stumbled across some interesting looking speakers in the second hand area and asked if we could try them. They were the same price as the bookshelf speakers I had just listened to. 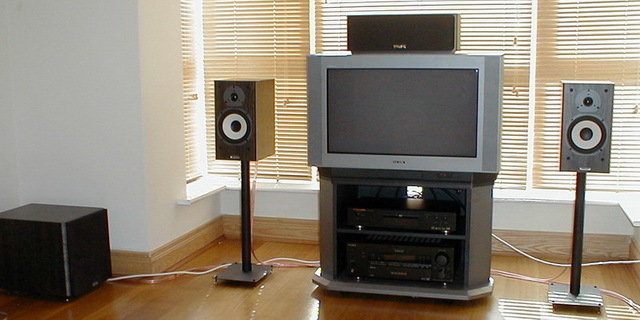 Now these were not bookshelf speakers they were much bigger Genesis IM 8200 speakers on matching stands. The difference between the speakers was like light and day, so I ended up getting a whole lot more hi-fi than what I could have imagined! That system kept me happy for a while. I put the speakers either side of my TV and hooked up the video recorder’s audio out to the AUX input of the amp for excellent stereo sound when watching TV. Visitors to my house who were mostly hi-fi ignorant and those whom had systems themselves were impressed. Then the day came where I had to depart for Dublin, Ireland to go and see Europe, I mean work for my company ;). I did not know where I would be living, let alone the room and space available for my hi-fi, so I left it with my sister. This was indeed a good choice, as the place I ended up living in was far too small to put the main speakers in the living area. The bedroom was not ideal either as it had a sloping ceiling (the roof line). 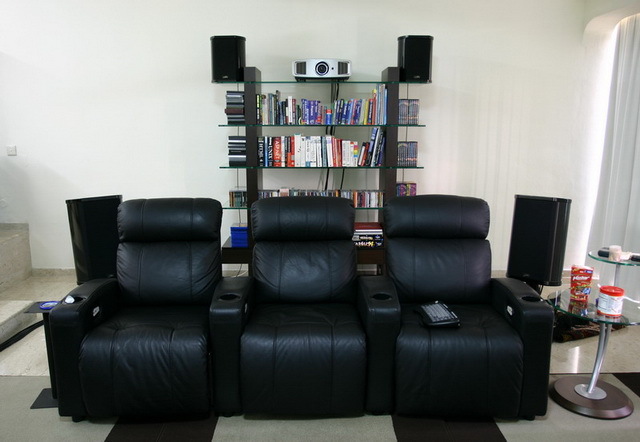 Now this was quite a step up for movies given I had been using stereo speakers before. However for stereo playback it was pretty average. I had to use the Marantz DVD player as a CD player and the Tannoy speakers might be good for their price and size, but the are no comparison for the Genesis. It looked like I would be staying in Ireland for some time, so I broke the news to my sister that I would be sending the hi-fi to Ireland. When the hi-fi equipment arrived in Dublin I set it up in my room and it was a pleasure to listen to music again. However, living with others as you have to do in Dublin because the accommodation is so bloody expensive, does not lend itself to playing music at a reasonable level. Being in a townhouse development sharing walls with neighbours did not really help matters either. This meant that I never really played that much music while I was in Ireland, which is not good for the soul! After spending two and a half years in Ireland it was time to move on again. This time I was heading to Singapore to see Asia, I mean work for my company ;). The place that I have here is much better with plenty of space for a reasonable system. This allowed me to put the Genesis speakers in as part of the home theatre setup for the first time. This improved the sound of movies dramatically, but now I had lost the ability to listen to CDs from my TEAC amp, which is much better than the Sony for stereo, even with the direct mode on. 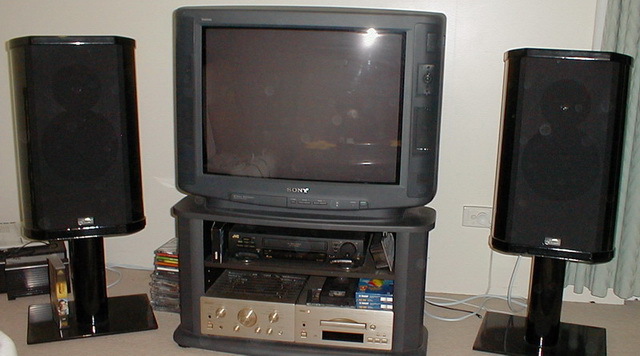 With a bigger room and the Genesis speakers next to the TV, the screen was looking a bit too small. I put up with the sound in stereo for the moment and looked at those lovely big plasma screens. 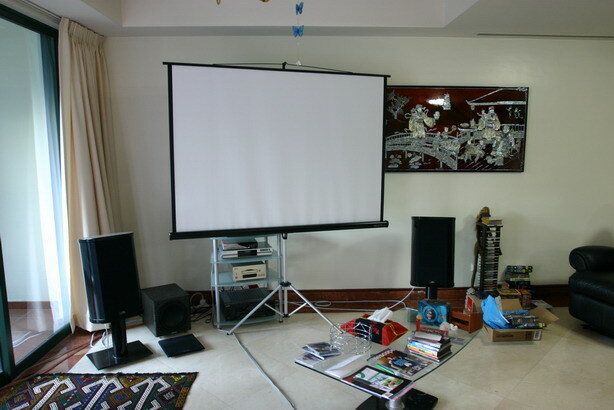 The problem was that to get a decent 42 inch in 2004 you had to pay around SGD$8,000. Now I could buy some serious stereo for that. Around the same time as I was drooling over plasma screens, the DVD recorder and HD/DVD recorders were starting to become reasonable. When walking around Suntec one day there was a special on at Harvey Norman display area near the entrance of one of the Suntec towers. They had the Panasonic DMR-E55 for SGD$499 which I thought was a steal given the reviews and price in the UK, so I bought one. After reading more about large screens (Plasma, LCD, and projectors) I thought it was time to give the cheaper DLP projectors a trial. Luckily when I was going to Funan to look at the Infocus/Screenplay store there was a projector setup on the ground floor with about 4 or 5 all lined up together so you could easily compare. Although there was quite a bit of ambient light it was still easy to see the difference in picture quality. In terms of features and price it was between the Infocus X1 (I think), Screen Play 4805 (upstairs in the Infocus store) and the BenQ 6100. The BenQ seemed to have the edge on the Infocus X1 and the Screen Play 4805 and it came with a free 70 inch screen, all for SGD$1,848! I had to get a special cable made at a store in Funan to convert the component out of my Panasonic DVD recorder to the PC type connection on the projector. The cable was quite a reasonable price and the guy made it up quickly even though he had customers coming in and out. With the setup I have now I get about a 76″ diagonal for 4:3 format material (i.e. TV) and 69″ for 16:9 wide screen DVD material. Now, as an exercise children, go and price a 69″ plasma screen and see how much it costs compared to my setup :). Oh an even if you add in the SGD$330 for the new curtains I put up to make the room darker, it will not come even close! The two day time photos below show how I had the projector set up originally. I have since moved things around a bit to make the screen and speakers in line with the wall, which resulted in better sound overall. As you can see below I had the right speaker toed in quite significantly to try and move the sound to my chair on the left. The quality of the picture is quite watchable, especially with live events like the Formula 1. Music videos look great too. Why spend the money on something that you only use for a fraction of the time. Obviously if you spend more time watching DVDs than TV then this doesn’t make sense. However, I spend 80% of my time watching TV and only 20% watching DVDs. What does the picture actually look like you say? Well here are a couple to give you a rough idea. The actual picture you would see is slightly better than what I can show here because TV is a continuous stream of pictures refreshed many times a second. Whereas a photo just shows a snapshot of time, picking up a number of refreshes during the period the shutter is open. Therefore, if there is any movement in the picture over that time the photo will be a bit blurred. Remember these are on a BIG screen! 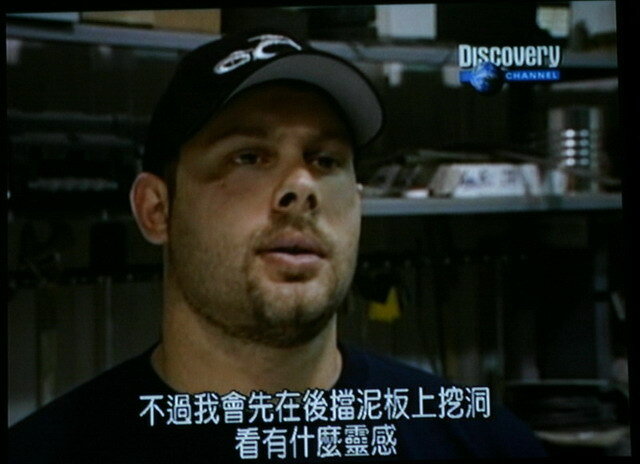 The first one is a shot of the American Chopper show on Discovery channel. The 2nd is from ABC Asia Pacific’s RAGE top 50 countdown. It’s still a 4:3 picture, but the music video was wide screen at the time, so I just cropped it. That is not including the TEAC CD Player as the remote I have only works when it is connected to the TEAC amp. I looked at an excellent site for universal remote controls called Remote Central.com. I decided to go for a reasonably cheap model from Sony, the RM-VL1000T, as it seemed to do what I needed. I have no regrets so far. It is easy to set up and has learnt all the commands that I fired at it from my other remotes. Soon after I purchased my projector I felt it was time to address the stereo performance of my system. There are a couple of ways that I could improve it. The first was to buy a completely new AV receiver/amp to replace the Sony STR-DB940. I’ve read quite a lot, and for the price here in Singapore, the Denon AVR-3805 seemed to be an improvement for both home theatre and stereo sound. If I chose the next models up across the range of either Yamaha, Pioneer, Denon etc. you end up with the all singing and dancing models that cost a whole lot more (SGD$5,000+). At that price it makes sense to look at separates. Now this is where things start to get interesting as it is totally out of my knowledge area. Should I just buy the Denon 3805 and accept that it should provide better stereo performance than my Sony and possibly my TEAC amp? Should I still buy the Denon 3805 and use the pre-outs to go to a power amplifier, like a 2-channel Bryston, or perhaps something a bit cheaper ;)? Should I match the pre amp/processor with the power amp and get something like a Rotel combination (RSP 1068 and RMB 1075)? Should I just keep the Sony STR-DB940 and use its pre outs to connect a power amp? Now that I look back on this it’s quite amusing what actually transpired. I was browsing the Echoloft’s (another Singapore based forum) buy and sell section and spotted a 2nd hand Bryston 14B ST power amplifier. I had been looking around at power amps and was keen to get hold of a Bryston if I could. In fact I was considering buying a new one if it made a big difference to my system. I was going to take my speakers into the Adelphi centre to the Bryston reseller and do a demo there. I was not expecting to see a top of the line model for sale on Echoloft and jumped at the chance to get one of these fantastic power amps. Buying one 2nd hand is not very risky since they have a transferable 20 year warranty! The only problems are moving it around (it’s heavy) and the hole it leaves in your bank balance ;). The beauty of the Bryston amp is that is has balanced and non-balanced (normal RCA) inputs, with the ability to change the source with switches at the rear of the amplifier. This means that I can have my Sony receiver/amp connected to the non-balanced connections from the pre-outs while using the balanced connections from a dedicated pre-amp. Now, I had to figure out what pre-amp to get. Again, while browsing Echoloft, I spotted something interesting, the Benchmark DAC-1. It’s a DAC with a built-in pre-amp and headphone amp. It had received very positive press and would solve two problems for me with one hit. That is essentially upgrade my CD player by using the Benchmark DAC-1’s DAC instead of my CD player’s and provide a pre-amp as well. At around SGD$1800, I thought it was reasonably priced for solving both my problems. The other fantastic thing is that the reseller was prepared to do a home demo! I trialled the Benchmark DAC-1 for a couple of days, but after about 2 hours I had made my mind up. I wanted one! The difference in sound was simply astounding, so much so that I did not really like it at first. Then I started to realise that I was hearing the true recording and when I put in some CDs that I knew well from when I was using my TEAC amp the smile appeared on my face. I was in musical heaven :). I have since taken the Benchmark DAC-1 to a friends place in Sydney. Yes, it’s a long way to take a piece of kit, but it’s small enough :). He has a tube pre-amp that he thought was the best thing since sliced bread. Using the Benchmark DAC-1 purely as a DAC neither of us could determine any noticeable difference to his excellent Sony player. However, once we removed the tube pre-amp there was a noticeable difference with much more detail coming from the DAC-1. When I was evaluating whether to get a new receiver/amp or go down the separates path I was also considering updating or matching my speakers for Home Theatre purposes. I went into Adelphi to have a look at the different places that had the Denon 3805 and their recommendations for other AV amps/receivers in the same price bracket. While I was looking around I found a second hand store and saw some Genesis speakers that looked like mine packed away near the door. The store was a bit busy, but I managed to find out they were the Genesis IM 8300 model, which is the next model up from mine. The IM 8300s are 3 way speakers, as apposed to the 2 way IM 8200s that I have. Now I was getting quite excited that I could put the IM 8300’s on the front and the IM 8200’s on the rear, needing only a centre speaker upgrade to have, in my mind, an excellent system. The speakers were priced at SGD$1,000. I asked if I could come back the next day (Saturday) and test the speakers. The owner of the store said that he should be able to around 2 pm. That night I called my friend Viktor back in Sydney who actually purchased some IM 8300s after listening to my IM 8200s. 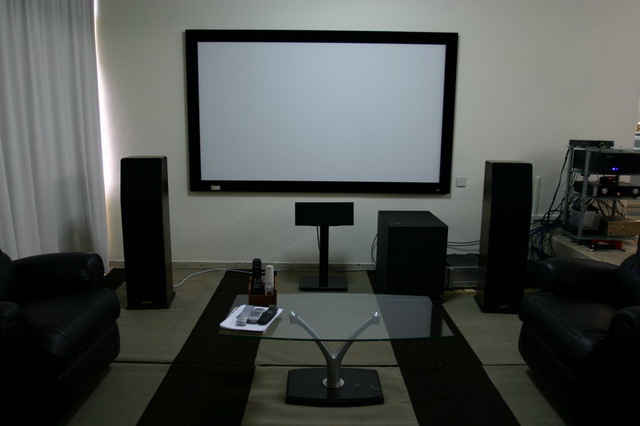 We discussed the price and what to look out for in terms of any problems with the speakers. On Saturday I went in to Adelphi again to find the Genesis speakers set up as they were by the door, connected to a Krell amplifier. The speakers were right next to each other, but the owner of the store had said they were very heavy and there was not enough room to move them around. This was a fair point at the time, so I agreed to listen to them as they were, right next to each other. The sound was quite impressive compared to my IM 8200 with much more clarity and power in the mid range as you expect. 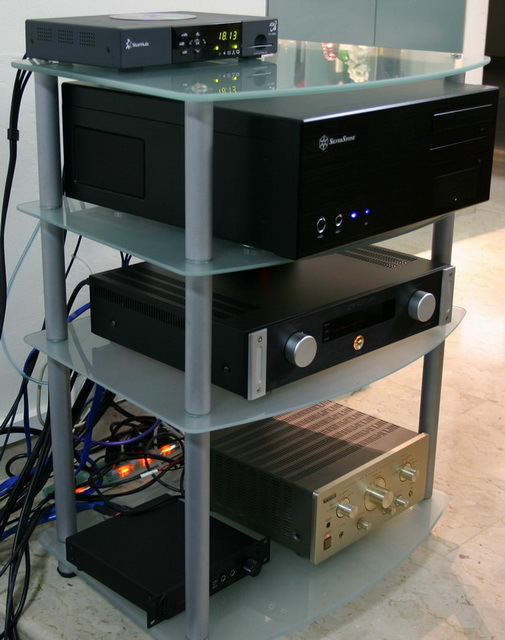 Having a Krell amplifier powering the speakers helps too ;). After listening to a few tracks on different CDs I was happy with the sound, so I purchased the speakers for $1,060 including delivery and some rubber feet added to the stands to make them more stable. I wanted to take the speaker upstairs to Alpha Audio to test the speakers with the Denon AVR-3805. Then I was going to take that lot to the Bryston store to see if using a 2-channel amplifier through the Denon pre-outs would make much improvement. The owner of the second hand store said that the people upstairs would probably say there is something wrong with the speakers if they did not sound right. I accepted this comment as to referring to the difference in amplifier and that it would be inferior to what I heard with the Krell. This was fully understandable and I had no problem with that. Still it was a strange comment. The guys in Alpha Audio were very accommodating and happy to set up my speakers for a test. Once it was all connected and we put a CD in (Norah Jones) I noticed a serious problem. The sound stage was over to the left. The sound coming from the speaker on the right was simply not as powerful or complete as the speaker on the left. Disaster! Suddenly the comments of the speakers being too heavy to setup correctly, no space in the store and that the people in Alpha Audio would say something was wrong with the speakers made more sense. There was something wrong with the speakers and it was not the guys in Alpha Audio needing to tell me, it was obvious! I was not impressed and went back downstairs to talk to the owner of the second hand store. He had gone out for some food, so I called him on the phone and asked to retest them in his store. When I returned he set them up to a different amplifier that allowed bi-amping. In any case it did not make any difference with a clear bias to the left. He tried to alter some of the connections and wiring, but there was still a bias. Since I had listened to the speakers and paid for them I was partly at fault. I would have been happy to look into repairing the speaker, but the owner did not accept that anything was wrong with them. I offered to pay $50 for the rubber feet he had added to the speaker stands, but he demanded I pay $100. I thought this was ridiculous given that the speakers were clearly faulty, but relented, as I do not know my rights as a consumer in Singapore. Anyone who wants to sell me some working Genesis IM 8300 or IM 8200 speakers are most welcome to contact me. One of the problems with having a projector is that it has to sit in the centre of the screen, which happens to be the best sitting position for stereo music, and home theatre for that matter. Apart from mounting this unit on the ceiling I could not think of how to fix the problem for a while. 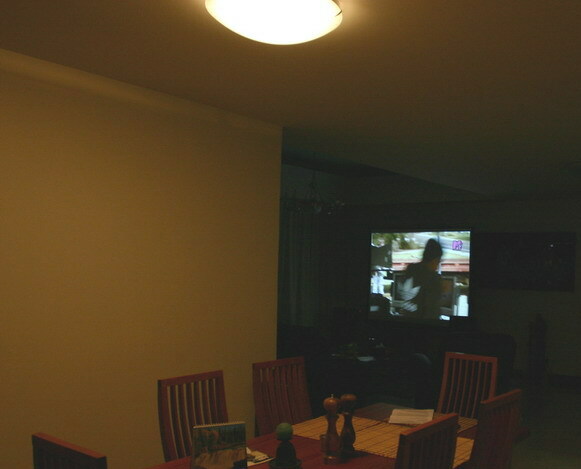 Given that I rent the apartment I do not think the landlord would appreciate me ceiling mounting the projector! I decided that a display cabinet or shelf of some kind would be the best solution and it’s worked very well, with one little problem. It is not quite tall enough, so I have had to put the projector on a box to raise it to a better height, as you can see in the photo below. Even with this amount of light during day time the projected image is quite watchable, especially for the type of material I usually watch during the day (sports, news and music videos). The next photo below is quite dark to show what the actual light levels are like at night. I now have two things that I want to change. The first is to replace the vacuum cleaner box that is holding the projector higher with something a bit more aesthetically pleasing ;). The second is to get a fixed screen and put it on the wall. The box is performing well at the moment, so the screen has priority :). Now. how to choose a screen? I have absolutely no idea about what type of screen (matte white, gray, black, etc.) would be the best for my room. It has quite a bit of ambient light and even at night when watching a DVD or TV I have a light on to make sure I can see what I’m eating! The picture below shows the light I use at night. Hopefully some friendly people at a local forum called Xtremeplace will offer some advice when I post a few questions there. I have moved from a very nice condo, Pebble Bay, to a rather average condo, King’s Mansion, because of the rent increases in Singapore. The sound at Pebble Bay was good, but could have done with some room treatment. Moving to King’s Mansion has been a bit of a disaster in terms of the sound quality. 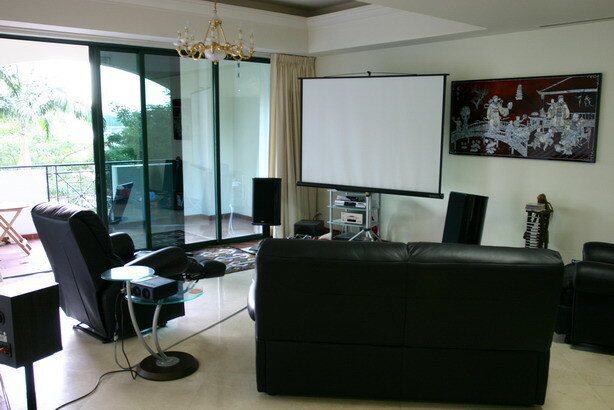 The living area is much larger and the room is very live. This then gives stereo music a live feeling irrespective if it was a live recording or not! From the photo above you can see that I have laid some cheap mats from Ikea to help a bit, but there is plenty of work to be done to try and make this room more stereo and home theatre friendly. Unfortunately I’m not an expert in room treatment, so I need help! Please give me some ideas :). Here is the view of the room from just in front of the projector. This is the view from the screen looking back. This is the view from the left-side speaker. The shelf with my equipment. 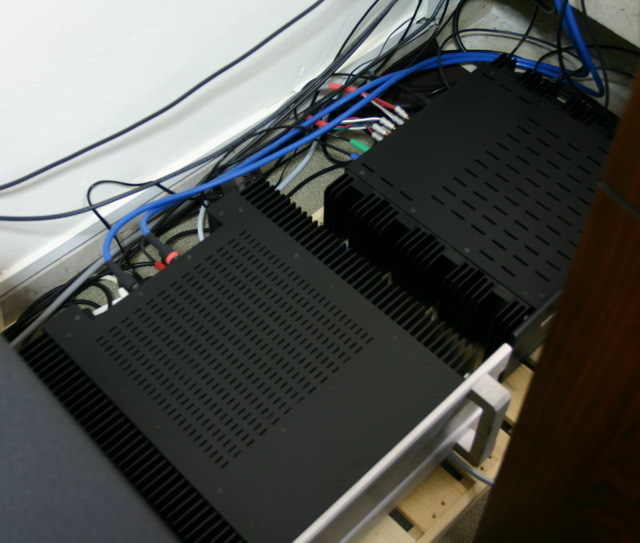 The two main amps are on the floor, with the little Teac above doing the rear 2 in my 7.1 configuration. 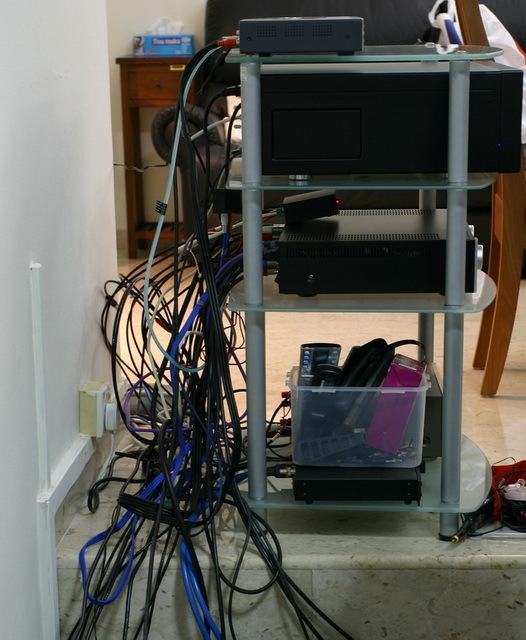 I’m sure this photo of my cables will make many people happy that theirs set-up is not as bad as mine! Hi Louco! your new place is much neater than the one in Pebble, at least I think so. I do not know about the sound do….. Why don’t you use one of the room as your sound room instead? 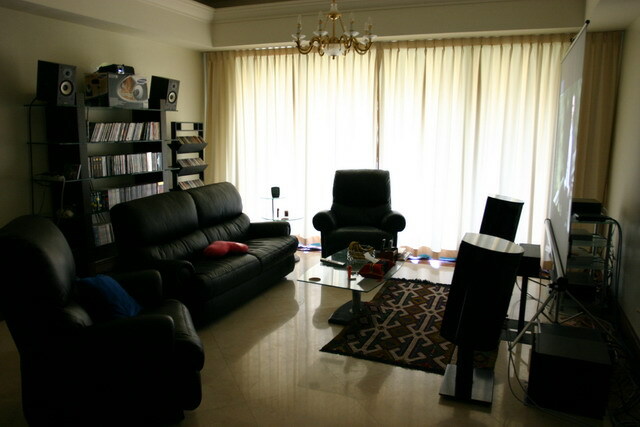 My current place is MUCH smaller than either Pebble Bay or King’s Mansion where I was before. I really need to update the page! I can’t find rooms big enough. My wife would love me to use a room, but until I can afford a few million dollars to spend on a house I don’t think that is possible! Just to check if your Lexicon NT312 is still available? No, sorry, I sold the Lexicon NT312 quite some time ago on Ebay and purchased an Emotiva XPA-5 to replace it. This allowed me to move to a 7.1 setup. I’ve since gone back to a 5.1 setup though because of a smaller room in my current apartment. 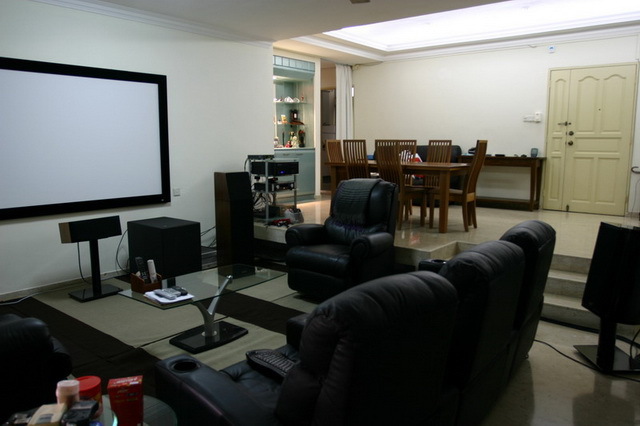 Love your home theatre system. Pls post more images to share. I’m waiting for the latest technology to filter through into new products. I’ll probably get a 4K projector when there are a few to choose from and I’ll get the Emotiva XMC-1 when it’s finally released. Once I have that in place I’ll update everything. I’ve been waiting for the Emotiva XMC-1 for years, so that’s why I haven’t updated anything ;).